I recently had an opportunity to do some hiking in the north part of Yosemite National Park, around Lake Vernon above Hetch Hetchy Reservoir. 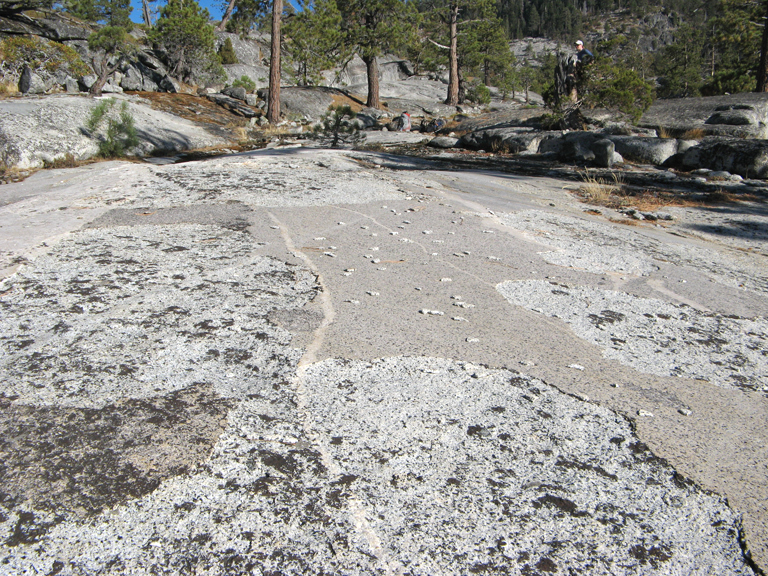 The area is mostly glacier-polished granite. I had never been there before, and I'm not very familiar with the material either. 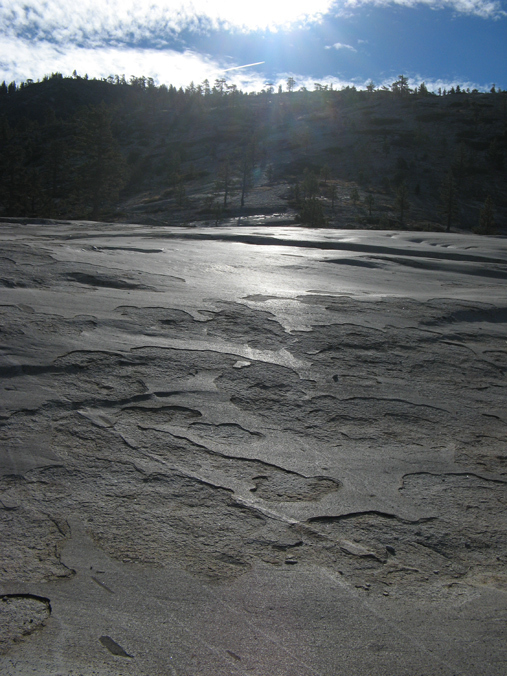 In walking over a few sections of rock, I was surprised to see thumb-sized regions of the rock surface flashing at me. On closer inspection, it turned out that the flashing was caused by the sun glaring off unusually flat and shiny crystal faces. Typically only one eye would see the glare at a time, and of course moving my head a few inches would make it entirely invisible. Here are a couple of animated gifs that illustrate the effect. Each animation is made from two pictures shot from slightly different viewpoints, overlaid and auto-aligned in Photoshop. This one was more severely eroded, as you can see from the closer crop that follows. It appears to me that the reflective surfaces are crystal faces that all have the same orientation, exposed by weathering. 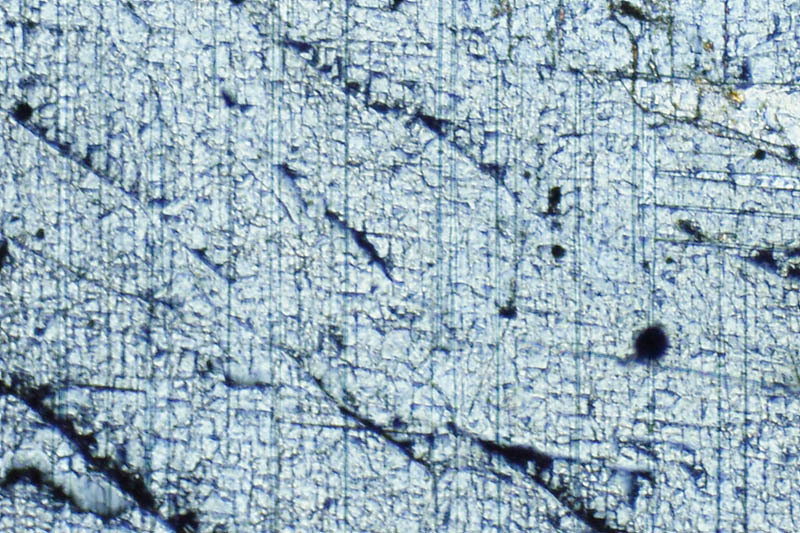 I have no idea what sort of material or crystal structures erode like this. If anybody else knows more, I would appreciate learning! Camera: Canon A710 IS, no attachments. Those are feldespar big crystals, likely orthoclase or albite (or more likely a perthitic asociation of both). Not exactly crystal faces but cleavage planes that are families of infinite parallel planes where the mineral breaks. Because all in each family are parallel they reflect the light exactly at the same angle. In the last image you can see that there are three cleavage planes almost perpendicular, typical of feldespars, a main component of granitic rocks (I never had the pleasure of visit Yosemite, but the main rock is granodiorite as published in many books). 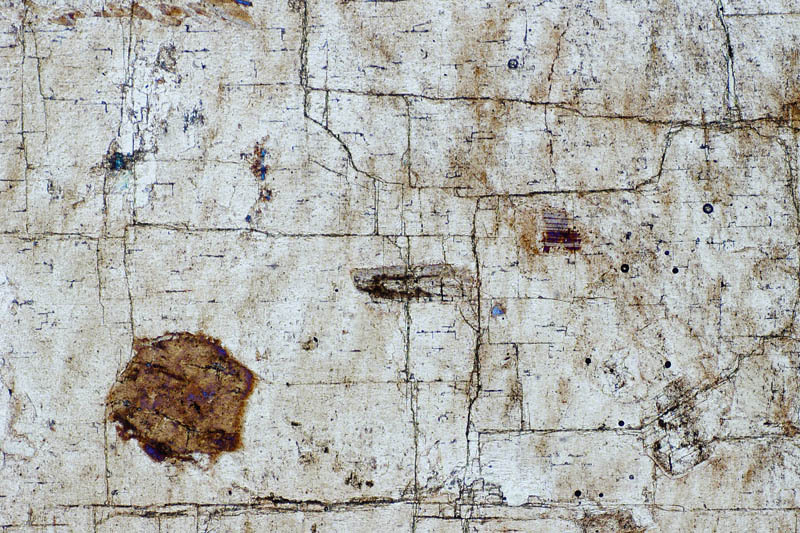 If you want I can post a petrographic micrography showing those planes. The flat eroded surface is impressive. Pau, thank you for the information. It is exactly what I was hoping for. Sure, post whatever else you think would be interesting. Km QUARTZ DIORITE OF MOUNT GIBSON-- Hornblende-biotite quartz diorite, coarse-grained, dark-gray to black, pyroxene-bearing. Color index varies from about 20 to 35. Contact breccia zone shown with stippled pattern. Potassium-argon age of biotite is 83.2+-2.1 and of hornblende is 81.5+-2.3 m.y. 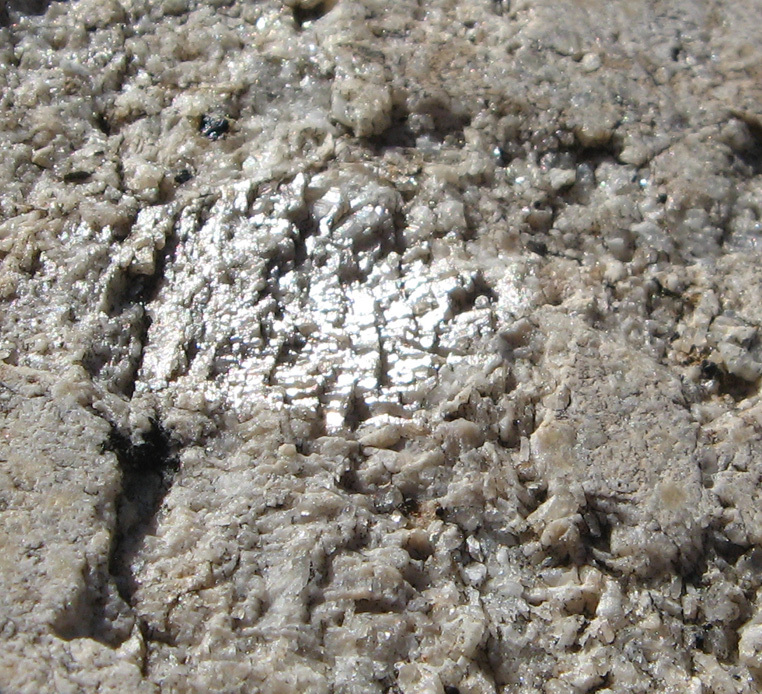 The polished and eroded surfaces were very interesting to me. It seemed that the glacial polishing process had left a sort of hardened "shell" on the rock, about 1/4" thick. In many areas there would be large expanses of almost intact polished surface, interspersed with places where the shell had peeled off leaving a rough surface beneath as shown here. In one place this weathering process was particularly clear, with numerous chunks of the "shell" having broken off and washed onto intact areas. We were intrigued to note that almost all the broken pieces had come to rest with the polished surface flipped down. Apparently they had been there for some time, as the underneath flat surface of the broken pieces had significant deposits of something crumbly. I don't know whether that was mineral or biological. Rik, thanks for the follow up and the landscape images. 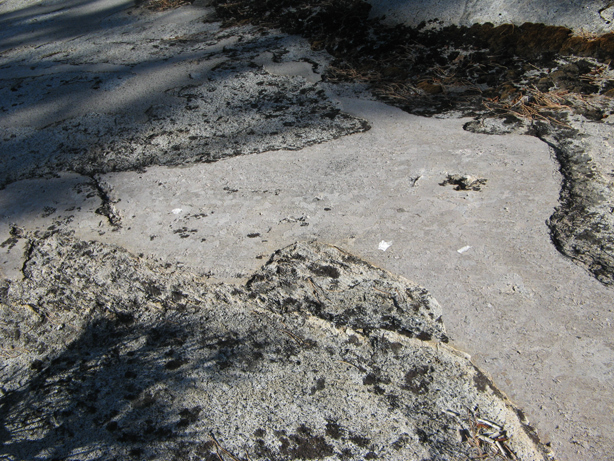 The altered surface at the last image is chemical, usually a both biological and inorganic, while the rock exfoliation must be mechanical both for expansion when the rocks placed over it are eroded and all that weight removed and due to the thermal contraction and dilatation of the rock, of course lately favoured by the ice expansion when the water at the cracks froze. Here you have the micrographies of thin sections. I don't remember the lens or magnification, I tink I placed a bellows over the polarizing microscope and a Zeiss Luminar at the nosepiece. Pau, thank you for the photomicrographs. The nearly perpendicular cleavage planes are very obvious. I am intrigued also by the hexagonal dark crystal in the upper image. There were a lot of similar appearing crystals in disaggregated material at our campsite, and elsewhere embedded in larger masses of rock. The first crystal I found on the floor of our tent was so isolated and symmetric that at first I thought it was a manufactured part. What is the hexagonal crystal? The hexagonal dark crystal in my image is biotite mica, but in base of your short description, I think the crystals you found may be hornblende amphibole because mica has a so easy cleavage* in fine sheets that is very difficult to find isolated well formed crystals ,and hornblende is a common mineral in granodiorites. Where them black prisms with romboid faces? *just one cleavage plane parallel to the image plane in my picture, so not shown in it.